Will this dog fight with other dogs? This page rates the tenancy of different breeds to fight with other dogs. It rates them according to their dominancy levels and fighting skills. A lot of factors play into it. Within every litter there are dogs who were born followers and born leaders. In other words, with different dominancy levels. Even the most dominant of dogs can get along with other dogs so long as the owners display strong leadership and proper dog to canine communication. If dogs are raised together and well socialized, they can be great friends, this applies to all breeds and types of dogs. Even a dog rated as "Friendly with other dogs" can be dog agressive. The bottom line is, in every individual dog it has more to do with the owner and the way the dog was raised than it does the breed, but it is a fact that, if a dog does get into a fight, some breeds are more skilled fighters than others and with the wrong owner and in certain circumstances, could be more prone to getting into a fight than another breed or type of dog. 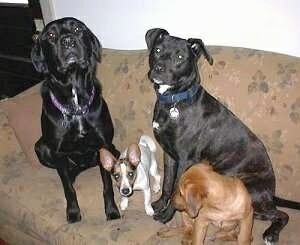 Notice the Jack Russell Terrier and the American Pit Bull Terrier in the photos below. They are an example of two breeds who typically have higher dominancy levels. But they get along great with their fellow canine family members. The bottom line is, it's all about the human owners. Owners need to be stronger minded than the dog, displaying enough authority to convince the dog that the human is in charge and is setting the rules that must be followed. Dogs who are secure with the amount of leadership the humans project will not fight with other dogs, so long as the humans are able to properly communicate their wishes to the dog. 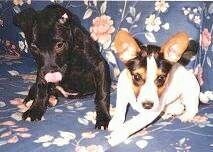 Master Frodo the American Pit Bull Terrier as a puppy with Speck the Jack Russell Terrier. 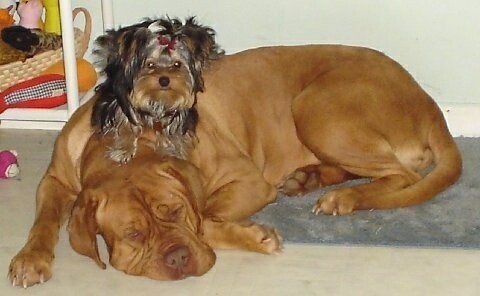 Four year old Diva (Dogue de Bordeaux) and six month old Chase (Yorshire Terrier). Chase feels the need to watch over Diva while she takes a nap.